Incorporating special luxurious things into a Wedding day is one of the best ways to celebrate this most special of special occasions. What better way for a Bride and Groom to do this, than to take the beautiful item of a Candelabra and make it the centerpiece of their Wedding! Candles have always been associated with both romance and celebration, combine this with the Candelabra, which is essentially a fancy multi armed candle stick holder, and suddenly things are taken to the next level, the result is an item of decor that is timeless, elegant, romantic, and stunning. Certain decor elements of a Wedding are by nature more prominent than others, for example at the reception the cutlery and crockery take second place to the centerpieces on the table, which are the 'highlight' decor items. So it becomes obvious that choosing a Centerpiece for a wedding is a very important decision for the Bride and Groom to get right, as it will change the way the entire room feels. So why are Candelabra Centerpieces such a popular choice for Weddings? Candelabras are associated with celebration, romance, elegance and luxury - which is just how a wedding venue should feel too, so naturally Candelabra Centerpieces make the perfect choice for a Wedding. In addition, there are so many different types and styles available on the market today, no matter what a Brides and Grooms personal taste is or what their desired Wedding theme is, there will be a Candelabra available to buy or hire that will match their wedding venue and decor. The range of Candelabras is truly as unique as each wedding; different heights, (low and long, medium, tall) different materials (metal, glass, crystal, even wood),and different colors (silver, gold, bronze, red, blue, white, clear etc). Some Candelabra Centerpieces only hold 2 or 3 candles; others hold many many more creating a cluster of glowing candlelight above each Candelabra. The styles can range from timeless and classic designs to formal intricate ornate designs, to modern clean lines. The choices don't end there, with decisions about what candles are best to use, (votive, pillar, or taper, etc) how many candelabras to have, and how best to place the Candelabras in the room it's no wonder people seek advice when purchasing or hiring their wedding Candelabras! 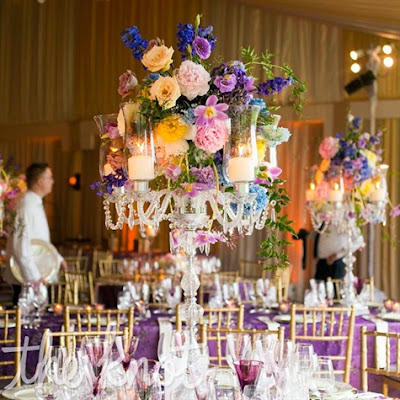 Candelabras aren't only popular at the Wedding reception, a Candelabra can become a centerpiece in the ceremony too, or simply be placed around the venue as demarcation or to highlight the ceremony. There are plenty of different candelabras available for just these purposes whether the ceremony is to be held in a church or not. 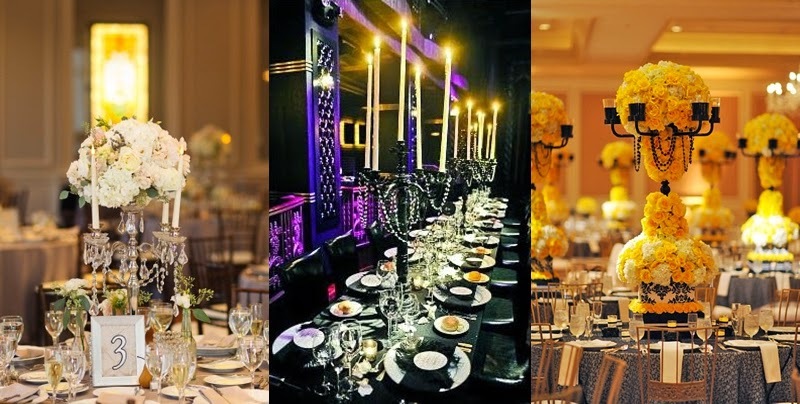 Another reason Candelabras are popular at Weddings is because they are such versatile items of decor, not only are there so many choices for style and type and material but they can be decorated or 'dressed' to suit the Wedding theme. 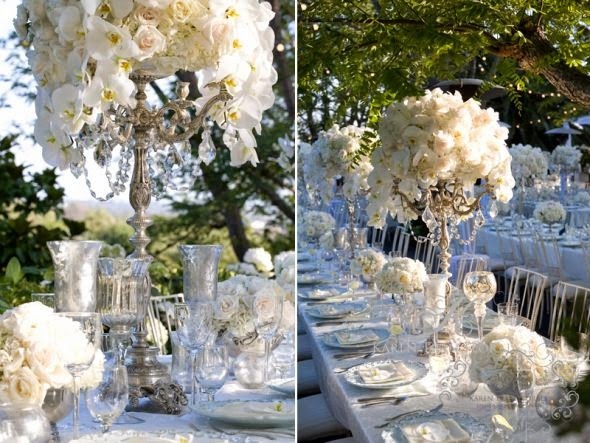 Flowers are a common choice for dressing Candelabras, as are fabrics and jewels. 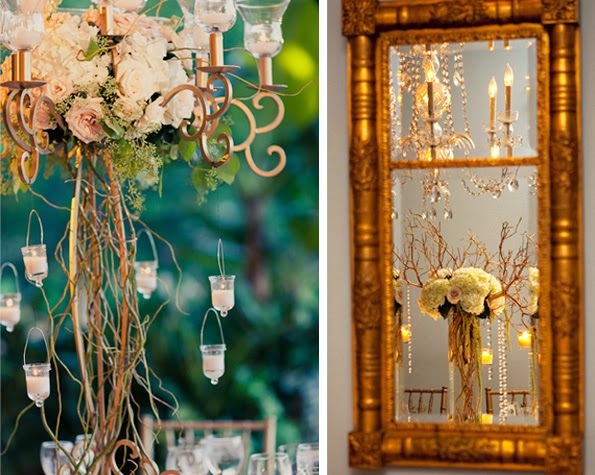 Again, which method of 'dressing' the Candelabra is best, depends on the specific elements unique to the wedding in question. Regardless of what type of Candelabra is best suited to a Bride and Grooms Wedding, it is certain to for fill its purpose to the utmost - adding that element of elegance, romance and 'wow' factor in a way that only a Candelabra can! 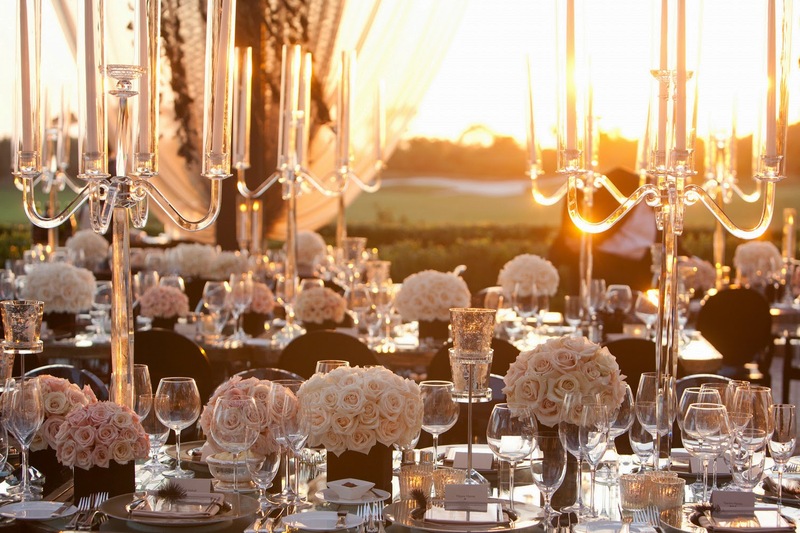 The only hard part for the Bride and Groom will be making sense of the huge array of styles and choices that await them in their hunt for the perfect Candelabra Centerpieces for their Wedding.